With Australia day approaching we are taking the opportunity to reflect and celebrate Peddle Thorp’s contribution to Australia’s obsession with ‘Big Icons’. 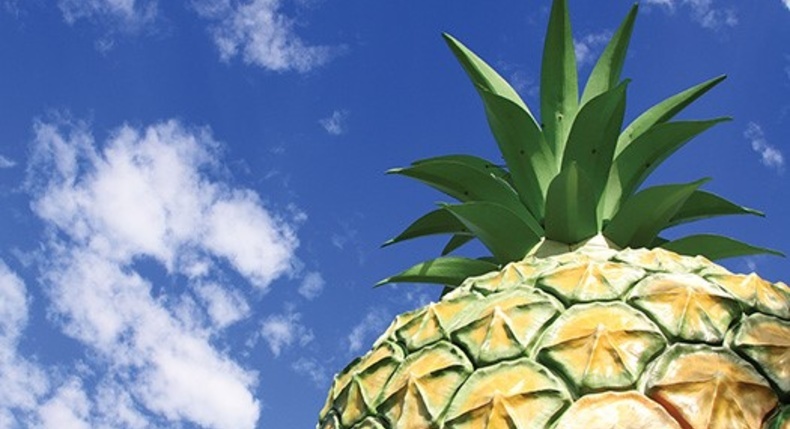 Our most celebrated is none other than ‘The Big Pineapple’ at the Sunshine Plantation near Nambour on the Sunshine Coast. Completed in 1971, the 16m tall fibre glass structure stands at the entrance to the plantation and was built with the intent to catch the eye of people passing by and has since become an international icon and a landmark of Queensland’s Sunny Coast including a visit from Prince Charles and Princess Diana in 1983. This long standing landmark was heritage listed in 2009 by the Queensland Heritage Council for its contribution to the south east Queensland landscape. Which at its peak saw up to 1 million visitors a year. Its purpose has evolved with a change of use overtime beginning as a café and information centre overlooking the plantation, to now where it plays host to a weekly fresh fruit market and the annual Big Pineapple Music Festival in May each year. It is easy to see that The Big Pineapple has been one of Queensland’s and even Australia’s most loved big attractions and will continue to be for years to come. Beyond Queensland, in the early 1980’s, PEDDLE THORP WKM designed the Crocodile Hotel in Kakadu National Park. Although not officially a ‘big icon’ the development has become iconic throughout the region due to its unique shape paying homage to the large number of crocodiles that call Kakadu home. Anyone flying over the region would be able to clearly make out the unique shape of the reptile from the air. The design of the hotel draws on the form of the crocodile at every opportunity, from skylights used for the animals eyes and the use of a warehouse roof profile replicating a crocodiles identifiable spike, to the angled structural columns mimicking large teeth. It’s the only croc in Australia you can get close enough to smile at. Guests enter via the mouth of the croc, with the hotel lobby located within the head, taking advantage of the animal’s proportionally larger head to create a large open lobby space. The hotel’s pool facility is the centralised heart of the croc with guest rooms either side creating the torso. Covered walkways form the crocs legs providing access to the car park and gardens. The hotel creates an unforgettable experience for tourists to the region, some would say there are not many hotels that are this truly Australian, Happy Australia Day.